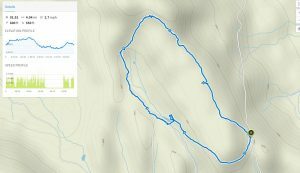 Van Meter Flat - Explore! Van Meter Flat - Explore! When thinking of places to explore, you probably start with public lands. 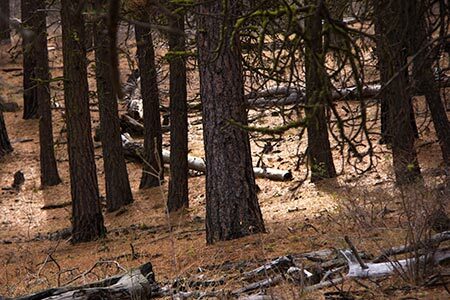 A community park, a county park, a state park, a national park or even a national forest. 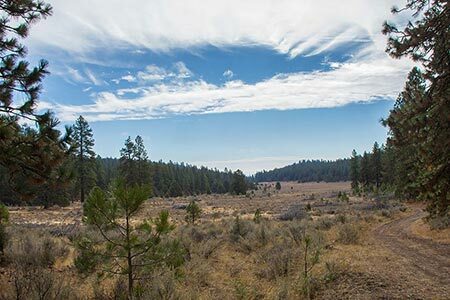 Where we live in south-central Oregon we are surrounded by National Forests, Crater Lake National Park, Lava Beds National Monument and several National Wildlife Refuges. Sometimes we forget that the Bureau of Land Management cares for almost 250 million acres of America’s western lands. For the most part these were lands bypassed by homesteaders and thus retained and ultimately managed by the BLM “to sustain the health, diversity, and productivity of the public lands for the use and enjoyment of present and future generations.” In our area, these lands are often in small parcels and unsuited to field agriculture. 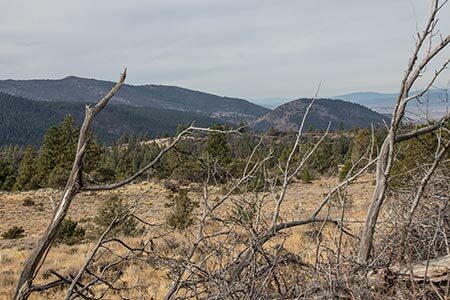 Some of these parcels have value for livestock grazing and timber management, but all of them have value as wildlife habitat and many have great recreational values as well. 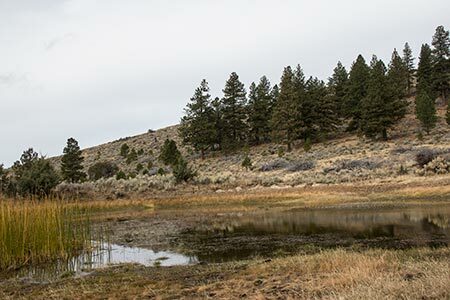 On this adventure, last fall, I joined the Klamath Basin Outdoor Group to explore one such parcel known locally as Van Meter Flat. 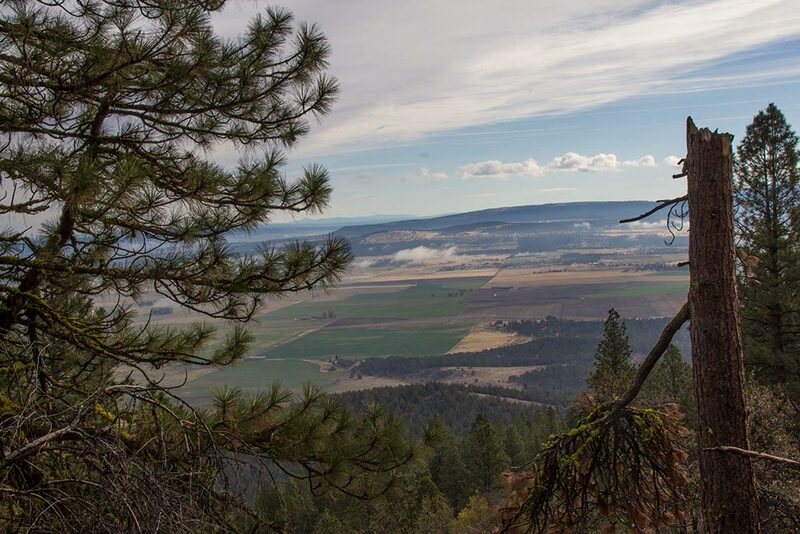 The flat is named after early settlers whose decendents still live in the Poe Valley area of south-central Oregon. “Franklin Pierce Van Meter is one of the enterprising men who have made Klamath county the prosperous political division she is today. His residence is in Poe valley, near Bedfield and there he owns a fine estate of two hundred and forty acres, half of which is under cultivation. “He was born in Lasalle county, Illinois, on August 9, 1854. The father, Jacob R. Van Meter, was born in Grayson county, Kentucky and came to Illinois in 1852. Five years later he moved to Kentucky and was a veteran of the Mexican War. The mother of our subject was Rhoda (Hackley) Van Meter, a native of Kentucky. She died in Redding, California in 1893, aged seventy-six. “The children of the family are named as follows: Dr. Abraham, a prominent physician at Lamar, Barton county, Missouri and who followed his profession four years in the Civil War; Isaac L., now deceased, who served his country four years in the Rebellion, being corporal; James H., deceased; Dr. Miles E., one of the most prominent and skillful physicians and surgeon in San Francisco, California, being also a lecturer on surgery and medicine; Franklin P., who is our subject; Marion L., a mechanic and fanner of Poe valley; George W., a machinist in Los Gatos, California; John H., a farmer and stockman in Poe valley; Diaries E, a leading machinist of San Francisco whose skill brings him a salary of two hundred and forty dollars per month; Mrs. Sarah E. McClure, deceased; and Mary, deceased. “Our subject grew up on a farm in Missouri and also learned the engineer’s art. His education was received from the common schools and he made the best of his opportunities. In 1876, he went to Colusa county, California and engaged in engineering. Two years later, he returned to Missouri and on August 13, 1878, there married Miss Maggie A. Carter, a native of Linn county, Missouri. Her father, Collin T. Carter, was born in Kentucky and came to Missouri in the early forties. In the spring of’ 1862, he joined a wagon train for Sacramento, Mrs. Van Meter being one of the children then in the family. In 1867 the family returned to Linn county via the Panama route and in all, they made five trips across the plains. He died at Springfield, Missouri, in 1900, aged sixty- six. He came from Irish extraction. “The mother of Mrs. Van Meter was Emily M. (Sandusky) Carter, a native of Kentucky, who died in 1872, in Linn county, Missouri. The other children, of the family are William S., of Greene county, Missouri; Lee D., of the same county; Mrs. Emily Adams, deceased; and George, deceased. In the spring of 1882 Mr. VanMeter came to Colusa county, California and engaged as a stationary engineer. For three years afterward, he was foreman on a ranch and in the spring of 1894, he came to Poe valley and located a homestead. He soon brought his family here and a careful invoice of his capital showed that beside his wild land, he had only five dollars in cash in all his holdings. He had very little else to do with, but undaunted, Mr. VanMeter took hold with his hands and has made a splendid success financially. Currently the area is part of the Rogers Cattle Allotment. 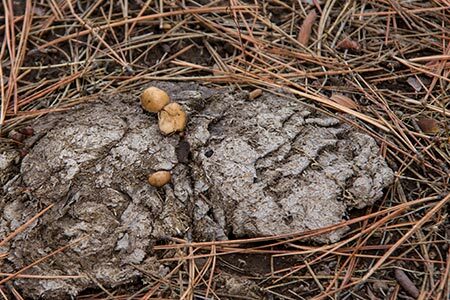 There are several improvements generally designed to facilitate cattle grazing. 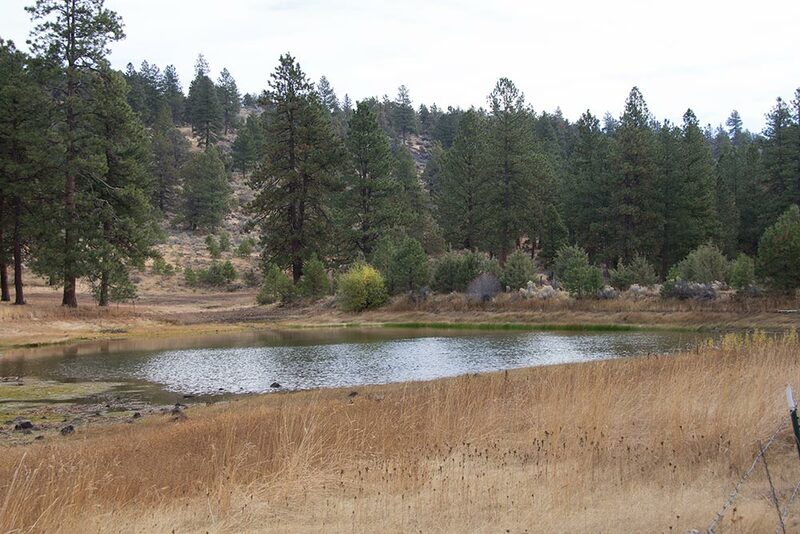 That includes a small road system and several ponds constructed to hold snow melt and rain for the cattle in this otherwise very dry terrain. Finding the way to a good place to begin a hike is not difficult. 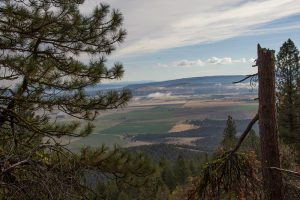 Starting in Klamath Falls, Oregon, head eastward on Highway 140 (the Klamath Falls to Lakeview Highway). 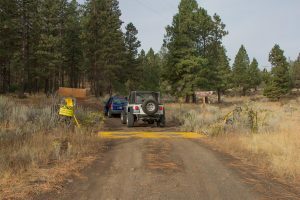 Just east of an OC&E Trailhead with a huge yellow snowplow, you will turn right (SE) and cross the Lost River [42° 10.388′ N 121° 38.088′ W]. After crossing the river turn left on South Poe Valley Road and follow it a meandering six miles to Webber Road [42° 8.230′ N 121° 32.139′ W]. At this point South Poe Valley Road makes a 90 degree bend to the east (left) while Webber Road heads to the west (right). Follow Webber Road westward for about 0.8 miles to Van Meter Road (40-11E-5.0) [42° 8.233′ N 121° 33.056′ W]. The entrance to Van Meter Road is shown in the photo to the right. Follow Van Meter Road up the hill about 1.8 miles to the point where another road joins it on the right. We found a parking area in the grass on the left side of Van Meter Road just past this road [42° 6.912′ N 121° 33.055′ W]. Use caution when parking as the area is very rocky. 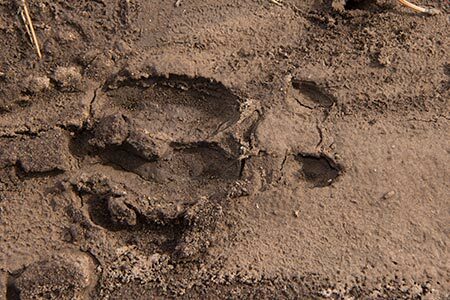 Note that Van Meter Road is closed from November 1 to April 15 to protect the deer that frequent the area in the winter and to protect the road from damage during the wet season. If the gate is closed, you can walk up the road, but you will add that 1.8 miles at each end of your adventure – and its all uphill on the way in. If there is enough snow, you could consider skiing in, but again, the first part will be all uphill. We walked back on Van Meter Road a short distance to the road we drove past before we parked. Our hike followed this road up the hill, to some great views of Poe Valley to the east. Our drive up Van Meter Road and our walk to the top of the hill was courtesy of Basin and Range geology. In this area a tectonic plate diving beneath the land surface forced it upward causing volcanic activity (ranges) alternating with block fault valleys (basins). 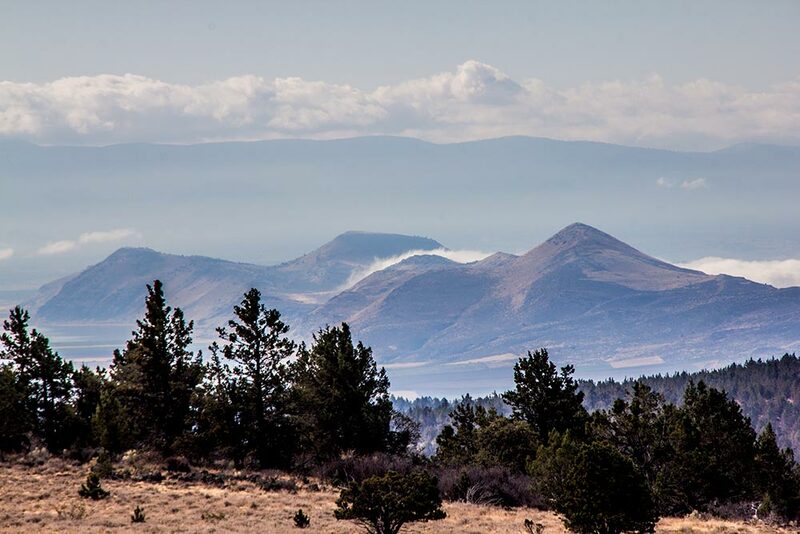 Poe Valley is one of those valleys and this mountain along with Stukel Mountain to the west are part of a volcanic range. 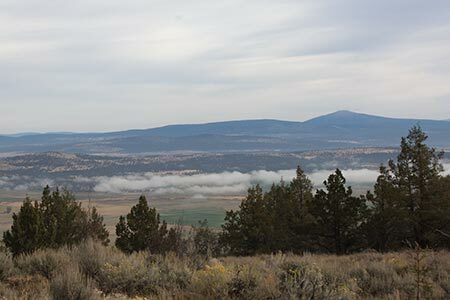 As the glaciers melted during the Pleistocene, Poe Valley as well as the Klamath Falls and Tulelake areas were part of Pluvial Lake Modoc2. Our view at that time would have been of water rather than the farm fields shown to the left. As we continued northwesterly on the road, we passed a couple of ponds that were just mud at this time of year. 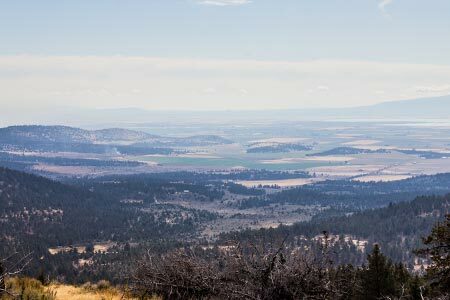 We also took a short walk up a ridge to the west to get a great view down into Van Meter Flat and southward toward the Tule Lake Basin. 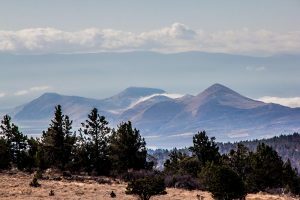 The photo to the right is a telephoto shot of Sheepy Ridge that forms the west side of the Tule Lake Basin. Continuing on, we came to a small pond – with water in it! We circled the pond and dropped down into Van Meter Flat. There is an old road that leads back to the ridge on the east and follows it northwestward. 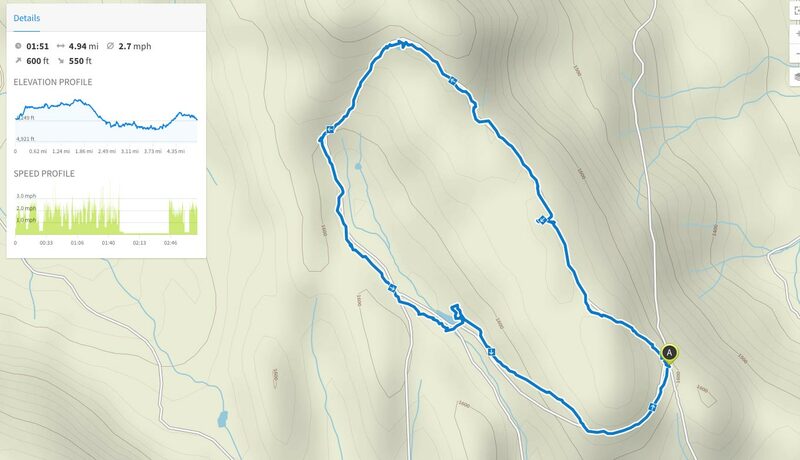 One could extend the hike another 2 miles by following it about a mile then following another road down the hill to the west a short distance to connect to a road that heads back toward Van Meter Flat. We took the shorter route and followed the road on the west side of Van Meter Flat to Van Meter Flat Pond. We circled around the south side of the pond, on the dam, and had lunch in a grove of trees on the east side of the pond. The photo to the left shows Van Meter Flat Pond and the grove of pine trees (far left) where we had lunch. The pond was constructed for cattle, but also serves a variety of wildlife. 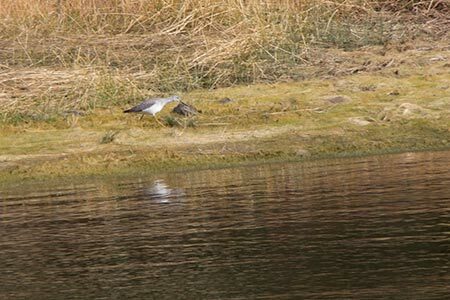 We saw deer tracks and, as you will see in the video, a greater yellowlegs hunting in the pond. There is a road that continues northwestward on the east side of the flat, but we headed southeast on the road. It climbs back up the ridge and back to where we had parked the vehicles. As we circled the southern nose of the ridge, we were able to see the entire Tule Lake Basin as far as the Medicine Lake Highlands. Unfortunately the day was not as clear as some, but the view was, nonetheless, stunning. The following is our path as recorded by the Komoot iPhone app. Note that due to sometimes poor satellite connections, the distance that is recorded tends to be farther than the actual distance traveled. Click the map for a larger version. 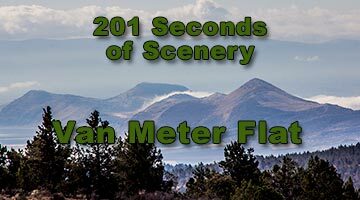 The video offers highlights of our adventure including some of the spectacular views of Van Meter Flat and points east, west and south. You will also see bird activity at Van Meter Flat Pond. For a larger version of the video, see our YouTube channel. Unless otherwise noted, the text, photos and video were developed by Jerry Haugen, your pathfinder, and ©2017 Global Creations LLC, All Rights Reserved. Shaver, F. A., Arthur P. Rose, R. F. Steele, and A. E. Adams, compilers. “An Illustrated History of Central Oregon.” (“Embracing Wasco, Sherman, Gilliam, Wheeler, Crook, Lake, & Klamath Counties”) Spokane, WA: Western Historical Publishing Co., 1905. p. 1036. Dicken, Samuel N. “Pluvial Lake Modoc, Klamath County, Oregon, and Modoc and Siskiyou counties, California.” Oregon Geology, November 1980, Vol 42 No 11.